Al Molinaro, best known for his role as malt shop owner Al Delvecchio on Happy Days, has died. Molinaro was 96. A former collection agency operator and real estate speculator, Molinaro didn’t break into acting until he was already in his 50s. After an early career dotted with appearances in a number of seminal sitcoms—Bewitched, Get Smart, Green Acres—Molinaro got his big break after making the acquaintance of Penny Marshall and, later, her brother Garry. The latter Marshall gave the actor his first regular TV role when he cast him as Murray the Cop on The Odd Couple, beginning a collaboration between the two men that would stretch across the next 14 years. After The Odd Couple ended in 1975, Marshall brought Molinaro over to his latest sitcom success, Happy Days, to replace the exiting Pat Morita. 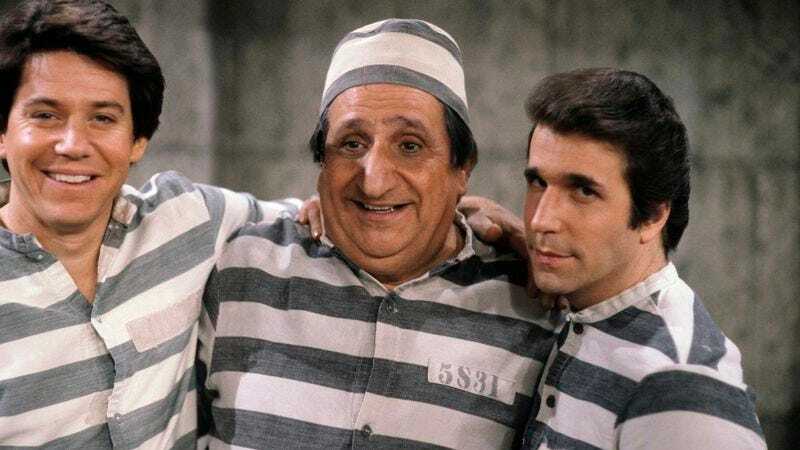 Molinaro’s character, the affable, ”yep-yep-yepping” Al Delvecchio, appeared in almost 150 episodes of the massively successful sitcom, growing more and more connected with the kids who frequented his place, and even picking up an identical twin brother (priest Anthony Delvecchio, also played by Molinaro). The character eventually married the mother of Scott Baio’s character Chachi, and followed Baio over to the short-lived spinoff, Joanie Loves Chachi.